The Crow Wing County Planning Commission will decide the future of two of its most famous residents. Simply put, it's a question of zoning. But the commission's ruling will determine whether Paul Bunyan and Babe the blue ox can move to a new home. Brainerd, Minn. — It's a Sunday afternoon at the Paul Bunyan Amusement Center. It's been home to the huge statues of Paul Bunyan and Babe for decades. But it will close at the end of the summer. Donna Freeman of nearby Pillager has gathered up her whole family on a kind of pilgrimage before the park closes in a few months. "This was my one chance to bring my kids. I'm very excited," says Freeman. Like many visitors here, Donna Freeman used to come here as a child. 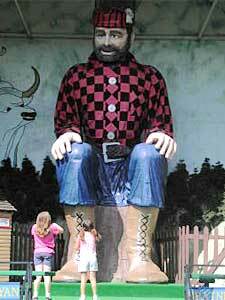 And the Paul Bunyan statue, whose mechanical arms and head move as he greets children by their first name, left a strong a impression. "I remember him saying hello Donna from Fairbault," she says. "It's one of my happiest childhood memories. It's a quintessential Minnesota experience." The Paul Bunyan statue sits in a log cabin structure, with pine trees all around. Kids clamber on Paul's big feet. Some are tickled by his booming salutations while others terrified. One kid even gets sick in a corner. "Ah, there we go, come on up here," booms the statue of Paul. There is of course a trick to this. When cashiers take the money, they also get the kids' names. "Now Annie Baxter, don't give away my secret!" the statue warns. But Seth Sorum knows all of Paul's secrets. Sorum, 19, has been doing Paul's voice for five years. With his tousled hair and long, thin, expressionless face, Sorum hardly cuts the figure of a lumberjack. "I just try to talk to the kids in Paul's voice," Sorum says. "I don't know, just having fun talking." People have come from all 50 states and 14 foreign countries. But still, owner Don McFarland says they don't make enough for a business that operates only three months a year. The Paul Bunyan park has been open since the early 1950s. McFarland bought the place from his wife Patti's parents 22 years ago. Since then he's never had a summer off. And they're ready to shut the park down. "It's tough, not as tough on me as it is on Patti," Don McFarland says. "She started in the gift shop at age 12 and made 10 cents an hour. I've been involved 22 years so I'm not as attached as she is." "I've been here long enough," says Patti McFarland. She doesn't wax any more nostalgic than her husband. "It's been a lot of work, an awful lot of work," she says. "It'll be nice to have someone else take over the work." So the Paul Bunyan amusement center needs a new home. Paul and Babe will move eight miles east of Brainerd to "This Old Farm," an historic theme park. Some of rides will end up there, too. Buyers across the country made bids on the statues. Many locals are pleased that Paul and Babe will stay in the area. We're not going to have concrete, not going to have asphalt, it's going to be all green grass. More of a park setting. - Alan Rademacher, owner of "This Old Farm"
But here's where nostalgia ends for some people. "It's going to be devastating to the area," says Colleen Rousu. She's in a bar just down the street from "This Old Farm." She and some of her neighbors fear big changes to this rustic setting. "Traffic's going to come out to this area," says Rousu. "We've been trying to keep it quiet. It's a nice community." Alan Rademacher's dad started collecting antiques back in the 1950s, and he founded "This Old Farm" to showcase them. Rademacher and his siblings inherited their father's love of the past, and now they maintain the place in addition to their full-time jobs elsewhere. "This Old Farm" will need to be rezoned to accomodate the addition of Paul, Babe, and the amusement rides. Rademacher says his family doesn't plan on excessive development of their acreage. "We don't plan on developing it beyond Paul Bunyan Land," says Rademacher. "We're not going to have concrete, not going to have asphalt, it's going to be all green grass. More of a park setting. Not an amusement park, but a park setting." At their own expense, the Rademachers will put in additional turn lanes off the highway to accomodate traffic. For many people, the Paul Bunyan statue is a symbol of a simpler time. But it may evolve into a symbol of the more complicated times that are down the road.